Built in 1818 to replace the earlier wooden structures dating from the late 17th century. It is now the towns’ Maritime Museum. There have been three pairs of lighthouses through the ages, from the original wooden pair, which no longer exist, then the brick built ones that still stand in Harwich, to the cast iron ones that still stand on Dovercourt Seafront. None of these existing lighthouses are used for navigation purposes today. The brick lighthouses in Harwich were built in 1818 under the supervision of John Rennie Senior to replace earlier wooden ones. They belonged to General Rebow who became very rich by charging 1d per ton light duties on all cargoes coming into the port. But in 1836 Trinity House (TH) acquired the Harwich Lights from General Rebow for £31,730, there being 12 years and 5 days remaining of his lease. It is suspected that Rebow had become aware of the changing course of the channel. The lighthouses became redundant in 1863 for just this reason and the new cast iron lighthouses were erected at Dovercourt opposite the present tennis courts. The High Lighthouse continued to be used by mariners as a landmark. In 1909, the High and Low Lighthouses were sold to the Borough Council. The Low Lighthouse was vested in the Harwich Corporation for 10/- (50p), but with the condition that it should be returned to TH if needed for navigational purposes. TH in fact took it over again in 1970 and converted it into a pilot signal station. In 1974, it reverted to Tendring District Council (TDC) on completion of the new Pilot Station at Angelgate. It became the Maritime Museum of the Harwich Society in 1980. The High Lighthouse was sold for £75 (without restriction) and was used as a residence. 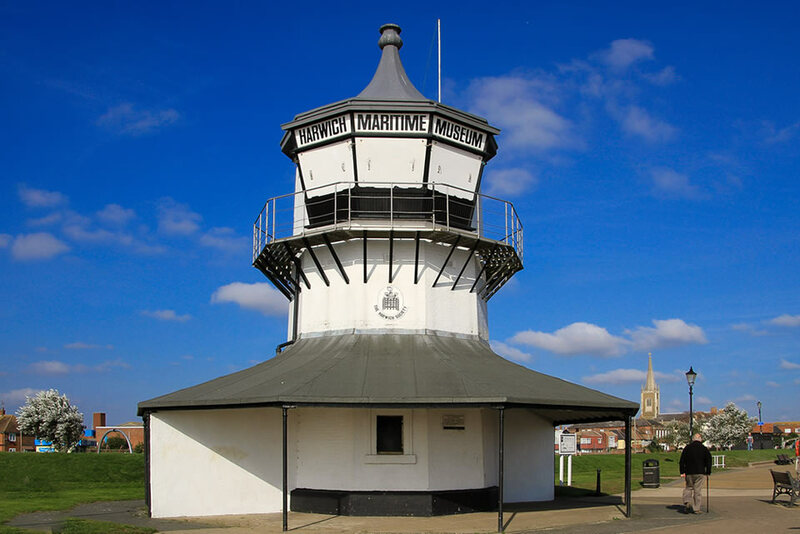 The High Lighthouse is now run by Harwich Society as a museum of local interest . Open at weekend afternoons during the summer. It was renovated by TDC as their contribution to Architectural Heritage Year 1975. The Harwich High and Low Lighthouses are 150 yards apart and were leading lights, i.e. they worked as a pair; with one light positioned over the other (as seen from the sea). The vessel was then on the correct course. The Low Lighthouse is a 45ft (16.5 metre) high, ten-sided tower of brick. The ground storey has a projecting canopy to provide public shelter. The High Lighthouse is a 90ft (32.8 metre) high, nine-sided tower of grey gault brick. The lighthouses were built 9ft (3.3 metre) to the south west of the original sites. The old wooden Low Lighthouse was built by the beach and is portrayed in one of Constable’s paintings. The old High Lighthouse was over the Town Gate (on the Felixstowe side of the present High Lighthouse). Both earlier lighthouses were coal fired. 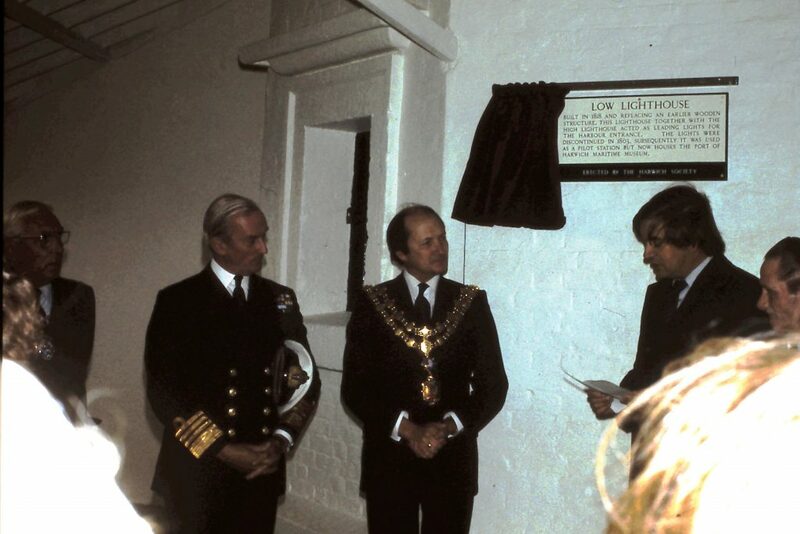 Saturday afternoon, 4th October 1980, was sunny but chilly when the Lord Lieutenant of Essex, Admiral Sir Andrew Lewis KCB, arrived promptly at 4.30 pm to perform the official opening ceremony and unveiling of the 1980 Harwich Society plaque. In the welcoming party were Chairman of Tendring District Council Fred Good, Mayor of Harwich Lindsay Glenn, High Steward Bill Bleakley, Peter Brunning, Vice Chairman of the Harwich Society and Andy Rutter, Secretary. Mr. Brunning, welcomed the very large crowd, estimated at over 120, and introduced the Lord Lieutenant. In his address Sir Andrew congratulated the Harwich Society and all who had worked to create the Museum. Colin Crawford, Maritime Museum Group Leader, proposed a vote of thanks to the Lord Lieutenant for finding time in his busy schedule to perform the plaque unveiling and Museum opening ceremony. The band of voluntary workers who had all done all the physical work inside and outside the Low Lighthouse were thanked by name. The museum is full of nautical memorabilia from photographs and paintings to ships in bottles and lighthouse bulbs. There are displays on the Royal Navy, including uniform and badges, and local commercial shipping. A fantastic view of the shipping activity in the harbour is obtained from the top floor. On street parking is available near the museum, which is only a 5-minute walk from the rail station. Also easily accessed via the foot ferry from Felixstowe. Admission Costs: Adults £1 Children must be accompanied by an adult and are free of charge.